The town of Sonsbeck, Germany photographed from an 8th Air Force Consolidated B-24 Liberator operating in support of the British 6th and American 17th Airborne Divisions engaged in Operation Varsity on March 24, 1945. In the center right is St. Mary Magdelena, a Catholic church that still stands today; most of the area was totally rebuilt after the war. As part of Field Marshall Sir Bernard Law Montgomery's 21st Army Group's Operation Plunder, these two divisions were air-dropped around the towns of Wesel and Hamminkeln. The B-24s of the 8th Air Force's 2nd Air Division came in around 200 feet (60 meters) to drop ammunition, food and supplies to the paratroopers. The largest one-day airborne operation in history, some 1500 aircraft and gliders participated. 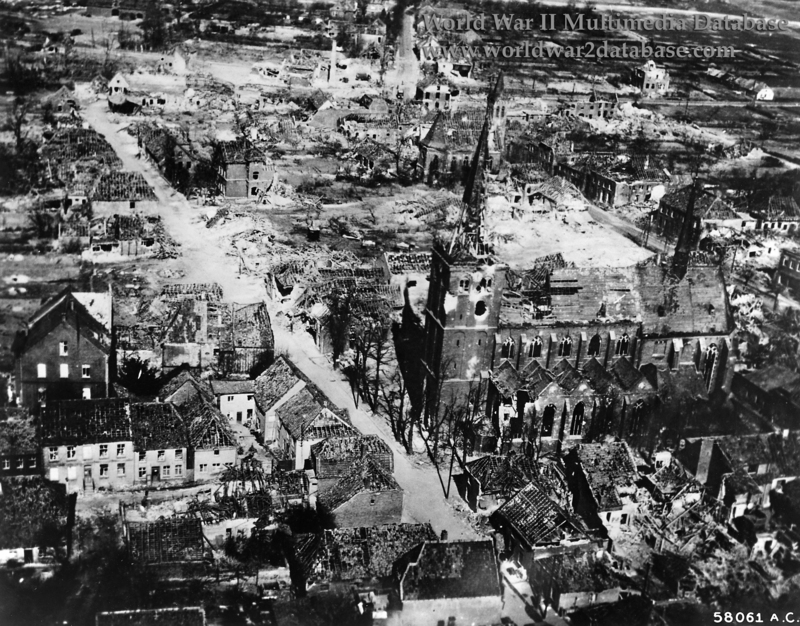 Wesel and Hamminkeln were heavily damaged by pre-invasion air bombardment and artillery shelling. At midday on March 24, 240 B-24s are sent to drop supplies in the US and British assault areas. Flying at 300 to 400-feet (91 to 122 meters); fourteen B-24s are lost (mostly to small arms fire), four damaged beyond repair and 103 damaged. Five airmen are KIA, thirty wounded in action and 116 missing in action. On February 10, 1945, during the bombing of nearby Xanten, two bombs and killed the farmer Peterhof and his son. Between February 11-24, the Allies made heavy air attacks on Sonsbeck. The old town center, the dairy, and neighboring villages were severely damaged. the bombing blocked all the the intersections and connecting streets. On February 24, the main dressing station was evacuated at St. Gerebernus. All intact buildings were destroyed in the next few days by carpet bombing and artillery attacks. On March 6 at 1600 Hours the invading elements of the Canadian 7th Brigade passed through the village. By that time, 85% of Sonsbeck was flattened.